There is a really good reason why this hermit should remain a hermit. I went to another holiday dinner at the home of my dear cousin, Johnny. For some reason, I didn't think about watching what I ate. It's been a while since I have been really strict, so I guess my brain is trying to revert back to its old way. I'm not worried about it. I've been a January 2nd dieter all of my life. I haven't lost any additional weight in the last month, but I haven't gained any back either. (I didn't weigh in today) I will be starting again strictly in two more days. That's not to say I will be eating with abandon today and tomorrow, but really, New Year's Eve only comes around once a year, and New Year's Day is a holiday. (excuses, excuses.....where are my Beck index cards?) So, back to last night's dinner: We started with a colorful salad, and went on to delicious barbecued lamb chops, roasted potatoes and asparagus. It was actually a pretty healthy meal. The problem is that I started with a cocktail which in turn let my resolve down, and I finished with the most delicious homemade cheesecake!!! The end of the year is upon us. I always like this time of year because I feel like I can forgive myself for all of the mistakes I have made throughout the year and get ready for a fresh start. I can strive to do better. I usually am at my heaviest weight around now. Halloween candy leads to Thanksgiving overeating, then to Christmas season indulgences. But.....not this year. Thankfully, I have made a drastic change in my eating choices and I am ready to step it up in the new year. As I review the last year, my change in diet also coincided with a change in my general thinking. I have thoughtfully and emphatically tried to change a part of my personality that often gets in the way of my own happiness. I have always been a "pleaser". I want everyone to be happy and I try to do my best to help others reach that goal. In the last couple of years, I finally came to the conclusion that it is an impossible task. As hard as I try to protect those closest to me, I have no power to insure their happiness. So, I can only be true to myself, and make choices that are well intentioned. Sometimes that means not being as social as I once was. It often means being a hermit. There is nothing wrong with being a hermit. As Albert Einstein once said, "Solitude is painful when one is young, but delightful when one is more mature." Blogging definitely helps me choose healthier meals. I've noticed that since I have quit daily writing, I am not as particular about what I eat. I am still entirely better than I used to be, but let's just say that I haven't lost any additional weight. What I do find amazing though, is that eating a certain way for 3 months really does change the way I think about food. I am always conscious about what I am eating. Even when I indulge, it is not at all to the extent that it was. The Christmas holidays have come and gone. Christmas Eve is always a special night with just the five of us. Christmas Day was a beautiful big party at my niece's house with tons of food and decadent deserts. In celebration of the day, I sampled it all! A couple of my nieces are pregnant, so I was lucky. Bigger stomachs really seemed to be in fashion. This is the last of my sermons; then I will go back to sharing what is on Patti's Plate. When bad things happen, especially of the magnitude of Newtown, Connecticut, I think it is only normal to question one's faith. It is so hard for me to grasp the concept of "free will". I hope and pray that one day it will all be clear to me, but in the meantime, I can only seek understanding and redemption of and from my thoughts. Mark 9:24 - "I believe, help my unbelief." There have been many times in my life that my faith has ebbed and flowed. I shouldn't discount what I have attributed as miracles in the past, when bad things happen. I need to remember the good and not focus only on the bad. Twenty two years ago, my father died. It felt like a part of me died with him. I loved him so much. He passed away in September. Three months later I was reluctantly preparing to celebrate my first Christmas without him. Five days before Christmas, I discovered an old roll of film in the back of my dresser drawer. Not knowing what was on it, I said a little prayer when I took it to get developed. "Please, Lord. Could I have just one picture of my Dad?" I got the photographs back and to my amazement, I was holding the greatest Christmas gift ever. 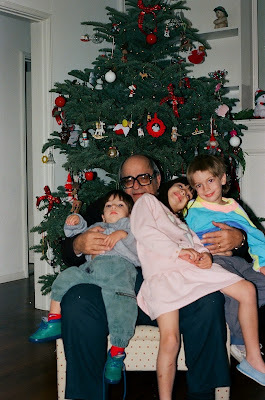 In my hand was a photograph of my father, with all three of my children sitting on his lap. It was taken in front of our Christmas tree the year before. It was an answer to prayer, and more. Merry Christmas, and God bless you all. I've wanted to go back to writing Patti's Plate, but in light of the Newtown shooting, the inspiration just hasn't been there. Last night, I watched Anderson Cooper, and got my first glimmer of hope since December 14th. Anderson interviewed the parents of Grace McDonnell, one of the Sandy Hook victims. The love expressed by these two remarkable people gave me a sense of peace that has been evading me. The softness in the mother's voice, and beauty in her demeanor was almost surreal. They said that they plan to move forward in their lives to honor the memory of their daughter. I felt encouraged to do the same. Grace was a little girl, innocent and full of love and vitality. She was all about love and peace and even asked for a birthday cake with a pink and purple peace sign on her last birthday. In memory of Grace and all of the victims of violence, I pray for peace this holiday season. I don't care what is on Patti's plate tonight. I doubt anyone else does either. Today our country was reminded again of just how horrible life on Earth can get. Sure, for you optimists out there, stories will follow about heroism, kindness and casseroles. I personally prefer to wallow in our misery. This is just too sad. Lately I feel like I'm writing a restaurant blog instead of writing about weight loss. That's not good. I've been maintaining my weight with the better choices that I am making, but I think I'm ready to start losing again. It's probably stupid timing with the holiday season, but I can definitely try harder during the week. Day 7 of the Beck Solution suggests that you change the tempting environment in your house. I need to rid my house of all fattening unhealthy items. This is definitely difficult with 4 other people living in my home, all of whom do NOT have a weight problem. Why should they suffer because I am overweight? Because we are talking about health, not just calories. I usually don't buy anything except healthy whole foods. The other night, Anne decided to make chocolate chip cookies. They have been calling to me every single night since. I am going to tell her tomorrow to take them to work, or they are going in the trash. They are definitely too much temptation. As far as dinner goes, just another boring salad made it's way to Patti's plate. I usually am not one to "do" lunch. I have never been part of the "ladies who lunch" club. However, today I celebrated my skinny sister's monumental birthday. (A year and a few days late.) We went to the Tavern in Brentwood and fell in love with the ambiance of the restaurant. Since my sister makes a habit of eating healthy, these days I just follow her lead. We started with a small white bean purée, and then we both had the Cobb salad. It was aesthetically beautiful, as well as nutritious and delicious. And believe it or not, unlike my sister, I didn't even finish everything on my plate. I'm hoping that all of the walking I am doing today will counteract the amount of food and drink that I am consuming. Anne and I spent time walking through the quaint decorated streets of Solvang and San Ynez. Since she is used to living in an area that is inundated with wineries, she was able to navigate our walk and introduce me to the intricacies of wine tasting. We tasted great wine and met some really nice people. But of all of the wine we had, it's hard to beat our own Greek favorite, Retsina. We stopped for a glass and a salad at Petros Restaurant. Thanks, Anne. I had the BEST time! I have the best daughter in the world! Anne has the day off tomorrow, so she took me to Solvang for an overnight getaway. We used to go here during Christmas time when the kids were small. The little Danish village is decorated for Christmas and it looks like a little winter wonderland. We went to a restaurant owned by the boutique hotel where we are staying.We split little small plates, so although it wasn't exactly dietetic, I didn't feel stuffed at the end of the meal. It was fun and delicious and worth the extra calories. Anne convinced me that I was doing fine since everything was so small. She also told me that I am not supposed to diet while on vacation. I guess she is definitely out of the running as my weight coach. This was probably not my best choice, but it was Saturday night and we were at Musso Franks! How could I not eat steak? The good news is that I only ate half so we definitely have enough left over to make into tacos for Tony tomorrow. On another note, Day 6 of the Beck Solution requires me to find a diet coach. It needs to be someone who I will be accountable to and who will give me encouragement when I am faltering. I've thought about who this person can be for awhile now. Most of my friends are too kind and let me off the hook too easily. I need someone who understands the "dieter" mentality but who also will have the strength to tell me when I am being too lenient with myself. I haven't decided yet. I'm not sure, but I think boiled endives are my absolute favorite vegetable! (Um....I take that back if avocados are considered a vegetable.) Tonight I am having a perfect meal. I have made salad, lamb chops and endives. The meal is so good, I can't really describe it. Does it compete with Barone's pizza? Actually it does. (on some strange level) My husband doesn't eat lamb, but LOVES pasta. I used to succumb to his wishes and make spaghetti pretty often. Tonight, he made himself a delicious smelling pasta, and I made myself two small lamb chops. We shared the endives and salad. We were both happy, but I'm telling you, my dinner was spectacular. Eating healthy has never tasted this good. (I know, I think I've heard that before.) My only regret is that I didn't put it on a prettier plate. Here I go again. My salads may be boring, but I am losing weight. Tonight I ate another salad. Day 5 of the Beck diet suggests eating slowly and mindfully. I already do. It's funny. I am a super slow eater, and my skinny sister is a super fast eater. Something there doesn't make sense. I savor every bite of my food. The thought of eating fast just doesn't enter into my head. Tonight I ate a small salad in the same amount of time that it took Tony to eat a salad, Sand Dabs, potatoes, vegetables and bread. Eating slowly may be good advice, but it is not earth shattering news to me. I just finished another good "diet day". I am one of the luckiest people on the planet. I can say this for a million reasons but today I will just pick one. Today I was able to visit with my son, Ted. I went to see him in Carlsbad, CA where he lives. It was great to see him and visit. We went to lunch, and I definitely got caught up in the moment since I seldom see him. We were looking over the menu, and there was a part of me that said, "celebrate, eat anything you want, you are with Ted, and you rarely see him." The other part said, "eat healthy, and remember you need to be accountable to your blog." I looked at the menu, and noticed that all of the salads were pretty highly caloric. I knew I could have asked to have the blue cheese or candied walnuts left off, but then I would have been stuck with the same boring salad I make for myself almost daily. The waitress came to the table and recommended the shrimp special. She said that most people who come to the restaurant come for that dish. She strongly suggested it. 1) Shrimp is very low calorie. 2) I hate to hurt her feelings. I ordered the special. Honestly, less than two seconds later I had buyer's remorse. I knew I had made a bad choice. The shrimp special came with grits and a special sauce. I don't even like grits!Ted even felt bad for me because he didn't want to hurt her feelings either. He offered to share his food. The good news is that I only ate a couple of shrimp. We took the rest of the food with us and hopefully his roommate likes shrimp. Learning lesson from this experience? The waiter or waitress only want you to be happy. Order the food that will make you happy in the morning. I'm very late in posting yesterday's entry. Let's see how many reasons I can come up with. 1) I couldn't bear to see Mom's picture not have top billing. 2) I ate another boring salad with grilled chicken for dinner. 3) I had nothing clever to say. That's it, really. But, I have to tell you, I was very happy when I got on the scale this morning. I am the lowest I have been in a long time. (No, don't expect a skinny person when you see me, just be happy that you haven't seen me in a while.) I have to admit, part of my success is eating boring meals. I know that salad with different veggies and a lean protein works for me. So, sometimes I will eat it over and over again. It doesn't make my blog very interesting, but it helps me lose weight. This is a picture of my mom and her Sunday afternoon lunch. She is 90 years old and still has quite an appetite. She has an appetite not only for food but for partying and going out. Thank goodness she had four kids. If she's not going out with one, she's going out with another. Two thoughts come to mind when I look at this picture. 1) My dad never had a chance. He was overweight and obviously his metabolism couldn't compete with Mom's. 2) I inherited Mom's appetite and Dad's metabolism. Bummer! I loved dinner tonight. I felt like I was cheating, because it was just so good. But, really? I ate almost all vegetables. Compare it to what I used to eat daily and there really is no comparison. I didn't eat any bread or anything fried. The only "non Virgin" thing that I ate was a little fresh Mozzarella. It was actually Burrata and so worth it. We went to dinner with a friend that I have known for over 30 years and her husband. It was the first time that I have been to the restaurant, The Six, in Studio City. I will definitely go back again. We started our meal by sharing small plates of cauliflower and Brussels sprouts. 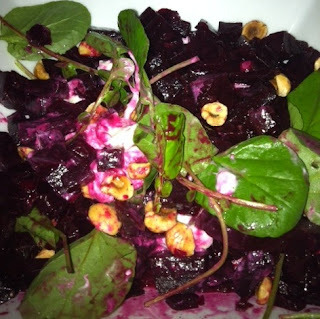 For my "entree" I ordered another small plate of beets. Day 4 on the Beck diet suggests that you give yourself credit for any positive changes or tasks that you accomplish. Well, I am definitely happy with myself tonight. Sure, I would have loved to have eaten the delicious looking hamburger that I saw the waitress delivering to another table. Or sharing a piece of one of the many small pizzas that they offered. (or eating my own) But, my mindset is slowly changing and I am still focusing on health. Today was an easy day to give myself "credit"! Good job, Patti!